ThermoWise, specialists in energy saving systems for the industrial, commercial, domestic and agriculture sectors, has launched a new range of environmentally-friendly showerheads, designed to reduce water and electricity consumption. ThermoWise showerheads, with vandal resistant technology guards to protect against theft and damage, have an integrated pressure compensated flow regulator that ensures a consistent flow rate, regardless of water pressure. The non-aerating spray design results in reduced temperature loss, thus maximising energy savings. Conventional showers use an average of between 30 and 50 litres of water per minute, of which 60% is hot water and only 40% is cold water. Energy saving showerheads can use up to 75% less hot water than a standard showerhead, ensuring significant savings on electricity consumed to heat water. ThermoWise showerheads are suitable for balanced and unbalanced systems, delivering a comfortable flow at about 10 litres/minute. The 90 mm diameter shower rose unit has a full impact spray, with rubber nozzles, a flow regulator and a brass knuckle joint. These showerheads are suitable for balanced and unbalanced water pressures. 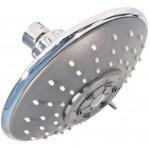 Also available is a 100 mm vandal resistant overhead showerhead unit, with a pivot joint for enhanced user comfort. 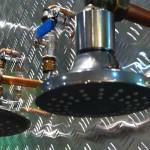 These energy and water saving shower systems have a payback period between three and five months. The ThermoWise range of energy saving systems also encompasses air to water heat pumps, calorifiers, induction cooking equipment occupancy sensors and monitoring equipment. The company offers a technical advisory, installation, maintenance and support service throughout Southern Africa.